Hurry - time is running out to register for the 2015 Symposium in Singapore! Late registration is June 1 - 15. A limited number of Workshops passes is available for US $475. Sketching passes are still available for US $40. Whether or not you have registered, visit and participate in our Discussion Forum. (It will make you want to attend!) Hope to see you there! The Executive Board is pleased to announce the appointment of Suma CM to the Executive Board as the new Secretary. Suma, a dedicated urban sketcher who has attended four symposia, will be leading an activity at the Singapore Symposium. Suma has taught various art courses and has served on a board of directors previously. Welcome, Suma! In need of a little sunshine this summer? Grab your sketchbook and head for San Diego, California, for the Third Annual West Coast Urban Sketchers Sketch Crawl Aug. 7 - 9. This free event is a marathon of sketching, socializing and fun in this beautiful west coast city. Instructor Frank Ching reported that the Line to Color Urban Sketchers Workshop he co-taught with Gail Wong in Laguna Beach and San Juan Capistrano last month had workshop participants who exhibited "enthusiasm, hard work and high spirits." Gail and Frank are now gearing up for their next workshop in Portland, Oregon (USA), Sept. 25 - 27. For information, contact Gail at gail@glwarc.com. The Executive Board would like to thank Jessie Chapman for her dedicated service as Membership Director. “All the hard work Jessie has done will help as we move forward with membership!” said President Elizabeth Alley. Jessie will be stepping down and redirecting her attention to serving USk in other areas. “I’ve certainly learned a lot,” Jessie said. “We have an incredible community out there!” We agree! Best wishes, Jessie! London Urban Sketchers are sketching Silvertown. Olha Pryymak and Nathan Brenville. 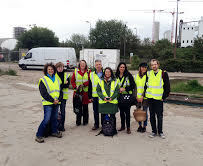 Urban sketchers in London are participating in an exciting project by special invitation: Following the £3.5 billion regeneration of Silvertown, a derelict 62-acre area in London's former docklands, according to James Hobbs. The project "will eventually have 3,000 new homes and 21,000 jobs, but it is now a dusty, windswept site that houses the monumental Millennium Mills and other former industrial buildings. Because of security and ongoing construction work, numbers are strictly limited, but as we will be returning over time, other regular urban sketchers in London will get a chance to visit and draw," James said. Sketches from the first group to participate are posted on USk London's blog. In other USk London news, the group had enthusiastic participation at recent gatherings at St. Paul's Cathedral and Kew Gardens. See the sketches on USk London's new Facebook page. Last month Urban Sketchers Sao Paulo celebrated its 50th sketch meeting. Participation "jumped from the average 15 to 20 participants to 50 people," reports Ronaldo Kurita. USk Sao Paolo is also excited about its exhibition of sketches from Sao Paulo, Mogi das Cruzes and Paris. The show is on through July 26 at Casarão do Chá. 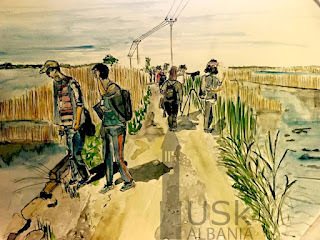 USk Albania sketcher Klaudia Sorra's sketch at the seashore. USk Albania went back to nature for a recent event at the seashore. 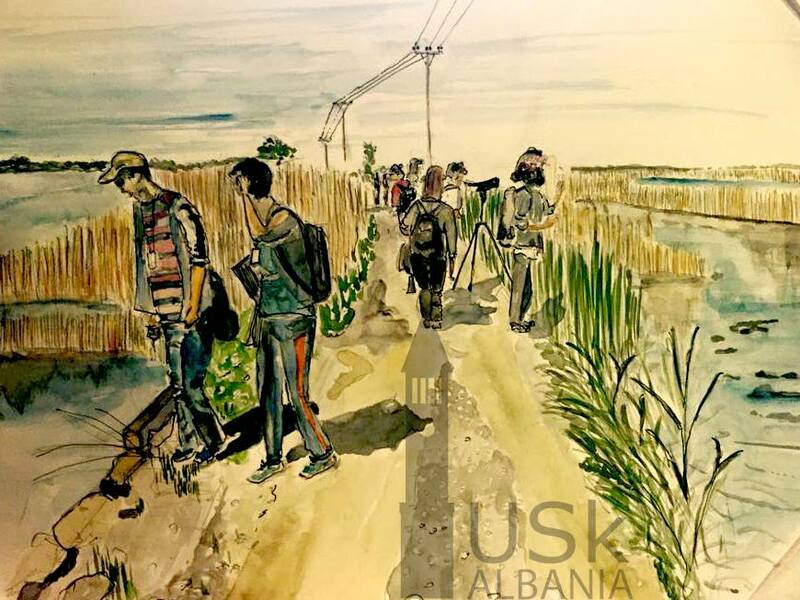 "We went there with our sketchbooks and sketched the nature and mostly birds which are typical of that area," said Mario Shllaku. He pointed out the difficulty of capturing birds in sketches: "We needed binoculars to see them, and we had to be really quiet because they got scared and fly away immediately." 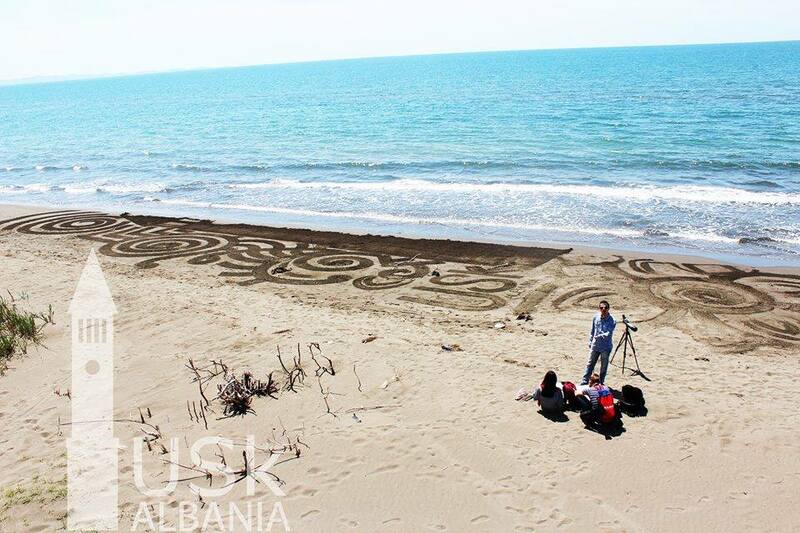 Endrit Haxhijaj commemorated the seashore event with a drawing in the sand of the Urban Sketchers Albania logo. The USk Albania logo depicted in sand. Urban Sketchers Paris has two events coming up in June. After two private sketching sessions at the Centre Pompidou arranged by Marion Rivolier and Nicolas Beudon, Mr. Beudon invited the Parisian sketchers to exhibit their sketchbooks at the BPI Centre through June 30. USk Paris was invited to draw the famous La Hune bookstore on May 12, which will sadly close its doors forever on June 15, said Marion Rivolier. 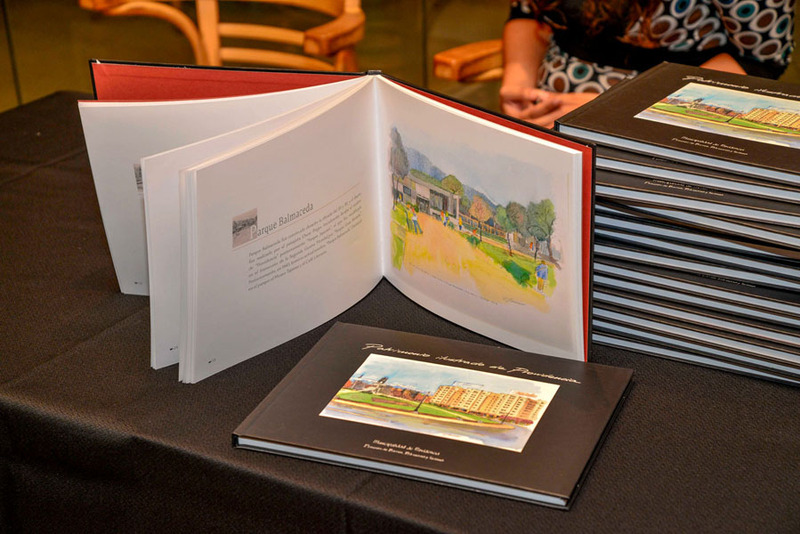 To celebrate the bookstore one last time, sketchers will exhibit their sketchbooks and drawings in the Saint-Germain-des-Prés bookstore June 2-12. A party for sketchers and bookstore customers will be held June 10. Juliette Plisson has a joint exhibition with Sophie Leplatre-Lesieur June 9 - 27 in Neuilly-sur-Seine. Juliette's work in the show focuses exclusively on urban sketches of this city. Sophie's work will include paintings of Nepal. James Hobbs has a new book, Dream, Draw, Design My Garden (published by Rockport), "a guided journal for artists, gardeners or anyone wanting to draw and design her or his garden, yard, roof terrace or window ledge," said James. Erika Brandner has illustrated a book that was just released at the International Book Day in Literary Cafe Bustamante Park. Illustrated Heritage of Providencia was edited and published by the Department of Neighborhoods, Heritage and Tourism of the Municipality of Providencia, Santiago, Chile. The book contains more than 50 illustrations of heritage and typical sites and buildings of this commune, said Erika. The books were given to the Library of Providencia, where they will be available for community and cultural organizations. San Diego (USA) USk correspondent Lydia Velarde gave a presentation in April about the "Art of Urban Sketching" to Cindy Zimmerman’s drawing class at Mesa College in San Diego. Lydia spoke about the worldwide Urban Sketchers organization and the San Diego chapter, showed some urban sketching tools and shared techniques. The presentation prepared students for an urban sketching event they attended later that week. Suhita Shirodkar was one of several artists and writers who reported on nationwide US rallies April 15 calling for raising the minimum wage for service workers. Her sketch of a New York City union leader surrounded by a crowd leads the reportage on the Eater website. Teoh Yi Chie (better known as Parka) of Singapore filled a 48-page sketchbook with his sketches of Bandung, Indonesia, while participating in an international sketchwalk organized by Bandung sketchers.